Many is the time that record collectors get asked “how many times did you buy” a particular record. 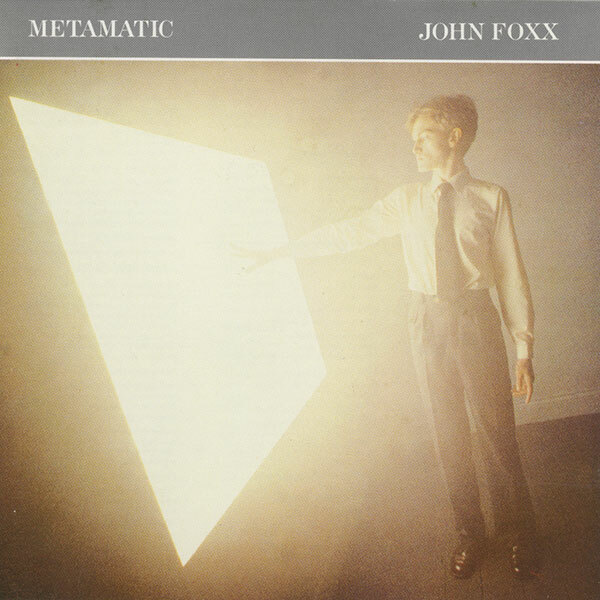 The obvious one for me is “Metamatic,” the seminal debut solo album from John Foxx, the former Ultravox[!] leader. I can count five copies of the album as titled, and there are a few exotic variants knocking around in my collection as well. The latest [and greatest] pressing came my way as a birthday gift from my thoughtful wife about a week ago. Let’s begin this tale with the initial album release on LP. I bought it as a UK album released on Virgin twice. Once in early 1981, a few months after it was released, and again 18 months or so later because my copy had become worn out. Additionally, there were two singles pulled from the album along with a further exotica, underlined below. Here now are the attendant releases that can be associated with the album. 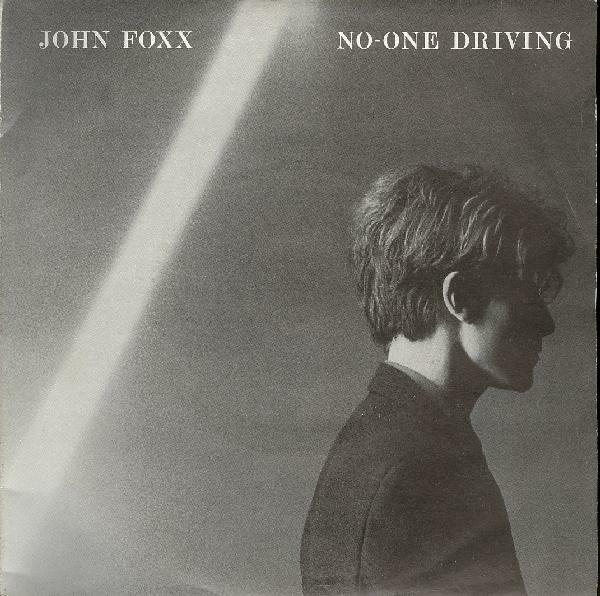 “No-One Driving” was released in three different 7″ configurations. The first of these was a two track single with the instrumental B-Side “Glimmer.” The A-side has been remixed from the LP version with one lyric changed for airplay. Instead of someone going “liquid in the sheets” they have gone “missing” instead. Though anyone with a knowledge of Foxx’s lyric tropes is aware that he is not making a sexual allusion. Rather, he is referring to liquidity as a metaphor for change, as in “He’s A Liquid.” The mix of the track is subtly different, with balance and EQ differences as well as rhythms that have been rendered “drier” and slightly off beat. “Glimmer” is an aptly named instrumental that flirts with an ambient sound. The full-monty double 7″ contained another B-Side, this time a vocal track called “This City.” It falls more squarely within the “metamatic sound.” With all four tracks allocated a full 7″ side, this was the one to get. Of course, with my collector’s sickness, I have them all. This curio was issued initially on lo-fi flexidisc that was included in an issue of Smash Hits magazine back in 1980. It sounds like a pre-Metamatic demo that he was working on after leaving Ultravox. It “rocks” a little more than the dry and clinical “Metamatic” album. The copyright and publishing information cites Island Music so this predates his publishing deal at the time of his Virgin Records signing. It’s amazing to think that a teen pop magazine issued this for its readership in good faith at that exciting time. 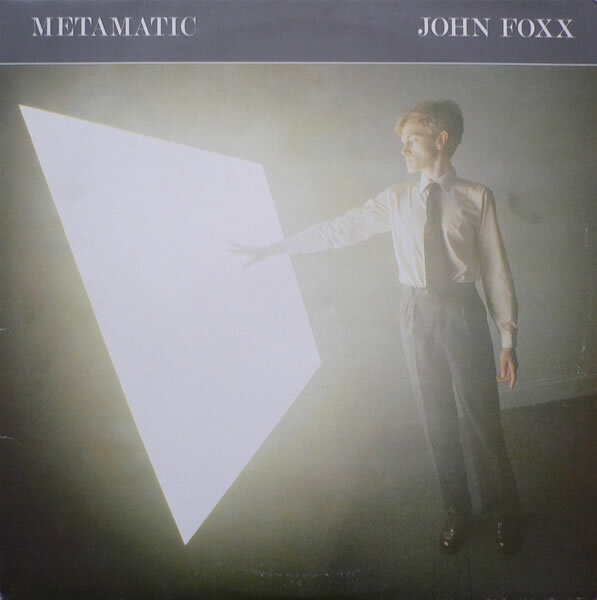 I also bought the Canadian “John Foxx” album, which was only slightly the “Metamatic” album. It was a compilation of five cuts from that album mixed with five non-LP A/B-sides. 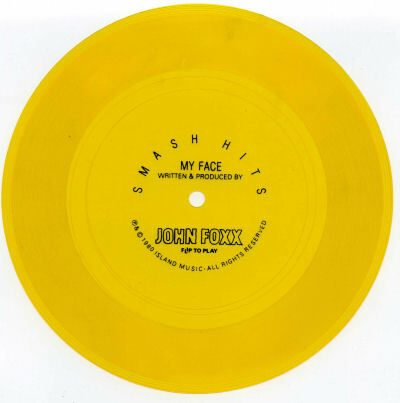 It’s primary significance, apart from more vinyl to fetishize by my favorite artist, is that this was the only place to hear “My Face” on something other than a thin sheet of flimsy plastic. Thanks, Canada! This was a non-LP single but firmly within the “Metamatic” period. “Burning Car” featured more J.G. Ballard lyrics set to carcrash music. The synth lines here begin to sound a little trippy and can be seen as having moved further away from the clinical “Metamatic” sound. The B-Side, “20th Century,” was made as the theme song to a British television show of the same name. 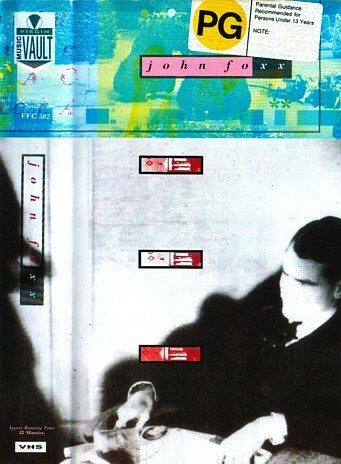 It is virtually an instrumental the prefigures the whole 8-bit electropop movement of 25 years later. It’s stuffed with what sounds like samples from early video game sound effects. Of course, Foxx didn’t use sampling keyboards until 1983. 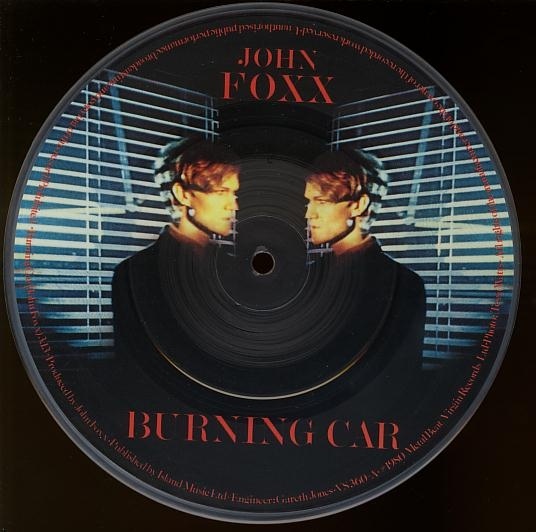 “Burning Car” was also issued as a picture disc with the identical music and new lower fidelity. The tail end of 1980 saw the last of four singles issued. 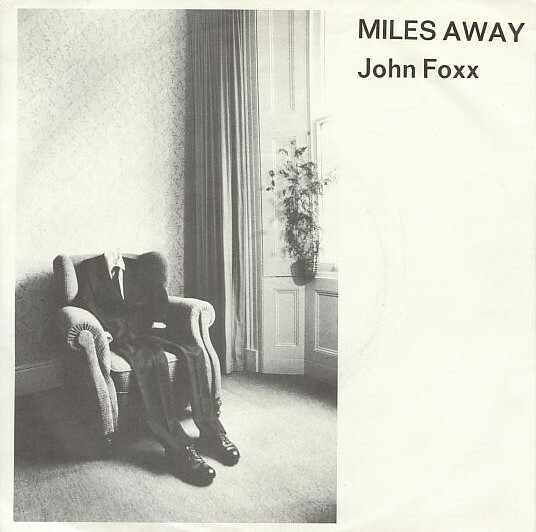 “Miles Away” is a firm movement away from the clinical sound of “Metamatic” and can be seen as a transitional record between Foxx’s first album and his second. The B-Side, “A Long Time” sees him returning to psychedelia with a full backing band, Shake-Shake, who are credited as such on the sleeve. Shake-Shake were Duncan Bridgeman and Jo Dworniak, who recorded a few sides under that name for The Compact Organization. They later went on to playing for Foxx on his next two records as well as forming the brilliant Post-Punk group Gardening By Moonlight. 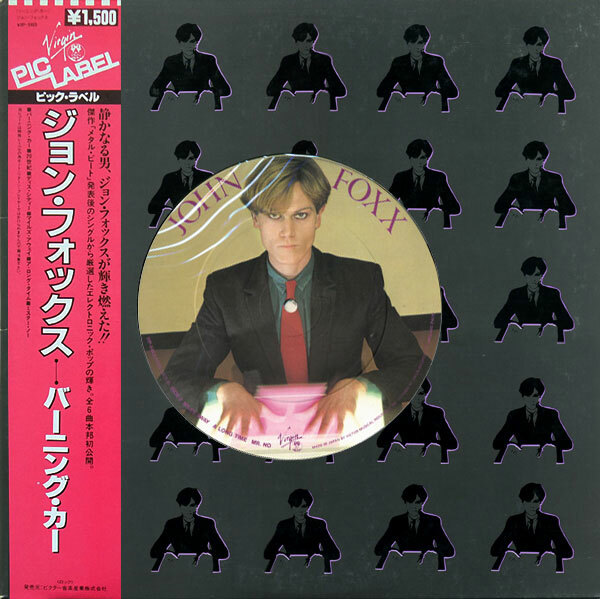 Finally, Japan got this neat-o 6-track 12″ EP with a pic label as VMI were doing at the time. 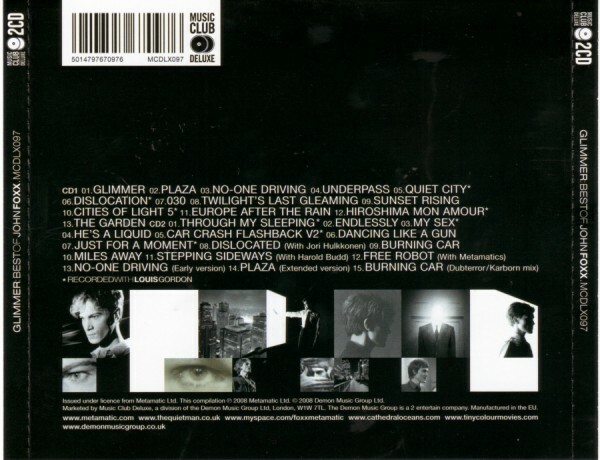 It brings together six non-LP A/B-Sides as were on the previous singles with one exception. The version of “Miles Away” here is the video remix version. ironically, I’ve owned this record since it was released, and I never actually played it assuming that it was identical to the 7″ versions that I was listening to [on tape]. I only found out this year about this, thanks to the amazing Version Crazy website. This sort of dissertation on release variations is what they do at Version Crazy as their alpha and omega; only with fantastic photography! 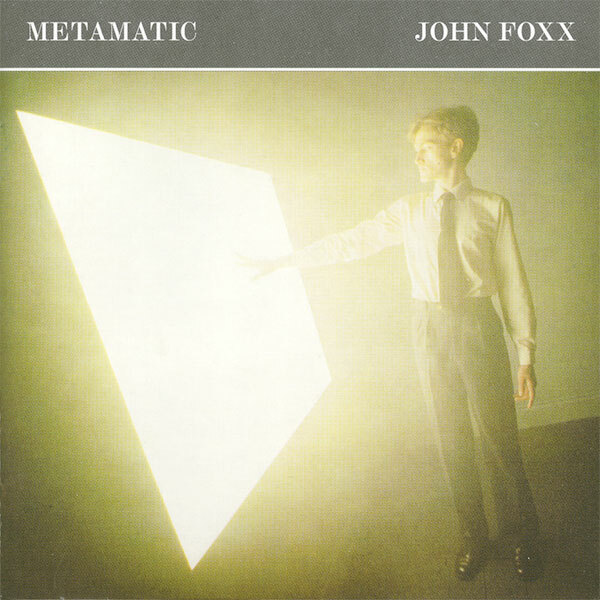 “Assembly” had even less of “Metamatic” than the Canadian “John Foxx” compilation. It held just four cuts from that period of his career. The sequencing left 6/10 tracks from “The Garden,” his 1981 second album, on out of sequence at the end of the disc. It still remained for his intensely electronic solo debut to make the leap into the digital realm. That finally happened the next year when “Metamatic” and “The Garden” appeared as Virgin CDs. The big news on this CD was the appearance of a track from the vaults that was previously unreleased. “Young Love” certainly sounded like part of the “Metamatic” sessions. There was a touch of the “20th Century” sound at work in the track with the video-game like sounds ping-ponging all over the sound field. At the time it was possibly the last new Foxx composition anyone expected to hear. He had been musically silent, apart from the two Nation 12 12″ singles, for eight years by that time. 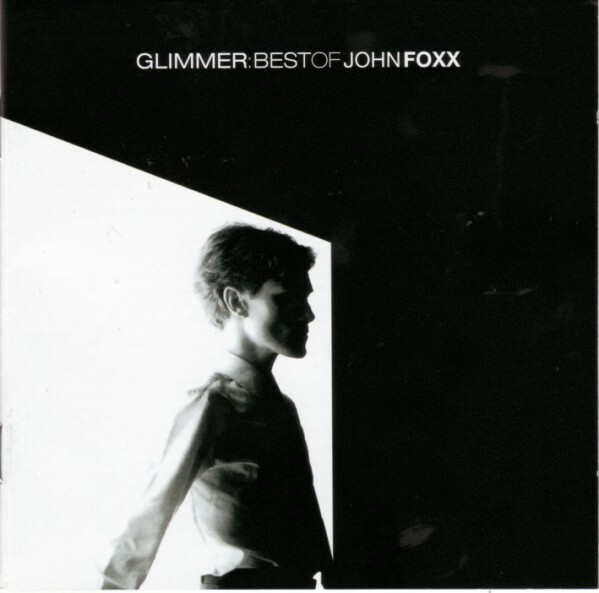 Four of the six bonus tracks are from the 1980 singles Foxx released, but “Swimmer I” was a B-side from 1981’s “Dancing Like A Gun.” The odd one out. The cool grey of the original album cover was rendered in a warmer color that was reminiscent of an L.A. haze. Scroll back to the top for a comparison. In 1993 Photoshop was still an exotic piece of software so the color correction on the repro is a bit off. Someone probably shot film of an existing LP sleeve and a color shift was all but guaranteed. 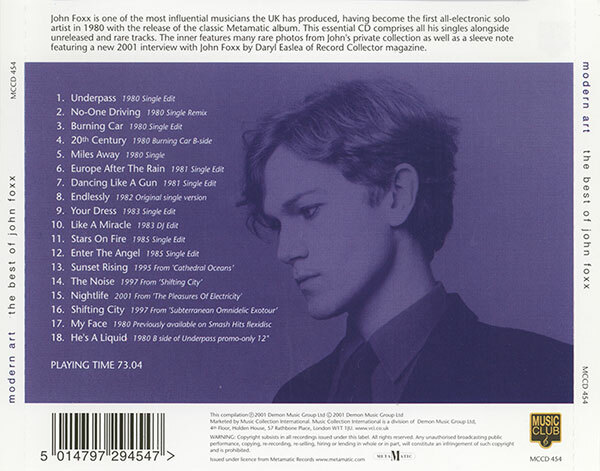 The back cover hewed close to the original LP sleeve. The booklet is a simple foldout with album lyrics and no notes/photos. 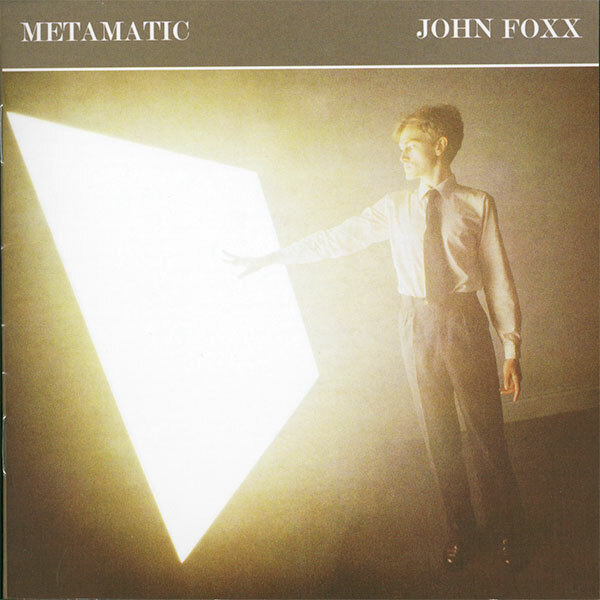 The next reissue of “Metamatic” was on the Edsel UK Reissue label. By now Foxx’s masters reverted to his ownership and he could shop them around to interested parties. It was good business to get closer to the truth of “Metamatic” with a fuller compliment of relevant bonus material. And it probably didn’t hurt that Foxx’s percentage was now more than he ever got from his Virgin deal. As you can see, the cover tends toward green on this version. The loss of “Young Love” hurts but the rest of the bonus tracks hit more of the 1980 singles target, though the transitional single “Miles Away” is included. The back cover tray insert combines a cover shot outtake with a profile shot rather clumsily. Better is the booklet in this release. It still features the lyrics to the album tracks with photos this time and a good interview/essay by Daryl Easlea of Record Collector magazine. 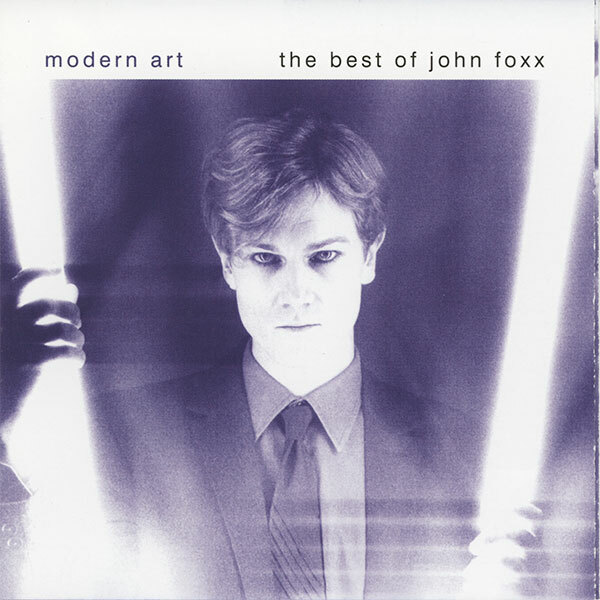 “Modern Art” is a valuable comp that paints a wide ranging picture of Foxx’s solo career. It’s packed with 7″ edits of all of his singles, with one exception. 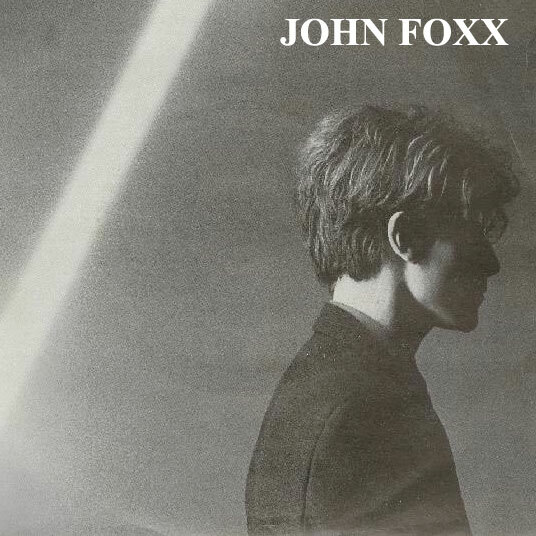 In 1982, Foxx’s only release was the 7″/pic disc 7″ of “Endlessly.” It was an explicitly psychedelic song that grafted modern technology onto the British psychedelia that made such a big impact on Foxx as a young man. He was present at the now-legendary 14 Hour Technicolour Dream “happening” in 1967 featuring the Barrett-led Pink Floyd and he’s often returned to the idea of synthesizing psychedelia and machine music. This single was his most explicit flowering of this idea. But there never was an album following it. About a year later his next single was another version of the same song, minus the backtracked sounds and sitars. This CD is the only place to find the initial single version of this cut instead of the 1983 version, which is his only solo single absent from the track list. 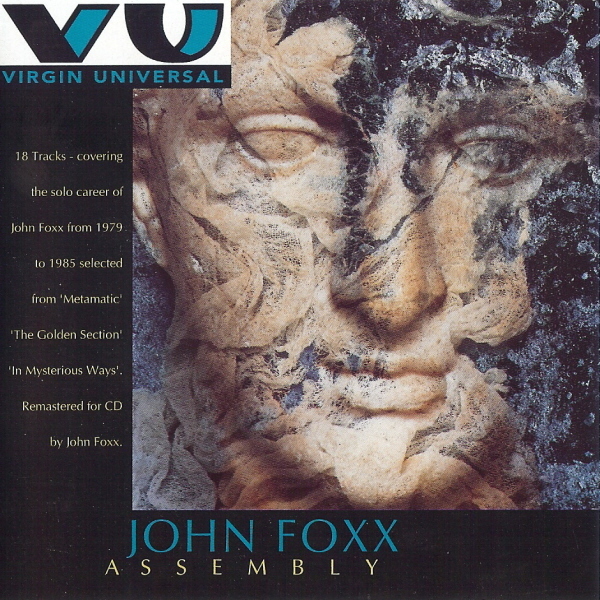 Foxx is listed as the supervisor of the comp and he went further than his Virgin material to include post-1985 material from his return to music in 1997, so this is the single most representative Foxx CD one can buy. He even gave “My Face” a digital release! Most intriguingly, there is the 1979 promo version that I’d previously heard on the Virgin Vault video of “He’s A Liquid” included here. The liner noted indicate that it appeared on the B-Side of a UK promo 12″ of “Underpass” that I’ve never seen any evidence of prior to the liner notes in this disc, which sport an excellent Foxx interview, again, by Daryl Easlea. Six years after the first Edsel remaster of “Metamatic” the definitive version of the album unexpectedly dropped. The cover sits about halfway between the 1st and 2nd issues in coloration but the original LP look will apparently never make it to print again. The first disc is the straight album and the bonus material is all on disc two. Lots of interesting things are happening here. First of all, the “Miles Away” single and B-Side are nowhere to be seen, and rightly so. It makes a much better stylistic fit for the following album, “The Garden.” So it comes as no surprise that the 2xCD RM of that title now sports the cuts. “Young Love” makes a triumphant return and “My Face” is also there now where it belongs. Lots of archival material make their debuts here. “To Be With You” and “Cinemascope” have never been heard before, and while the former is obviously an early experiment that’s moving toward the “Metamatic” sound, “Cinemascope” is a fully formed track that sounds astonishingly contemporary when heard next to his modern material with Louis Gordon. It’s amazing to finally have these songs after nearly 30 years with no mention of them whatsoever. The booklet to this definitive release contains the lyric to all of the songs, even the ones that were not originally on the album. A selection of familiar period photos are included, but no liner notes or interviews are to be found on this remaster. Hold on to the 2001 version for the booklet, but in all other ways this is to be considered the definitive remaster of “Metamatic.” All of the material that by rights should be here is present. But wait! 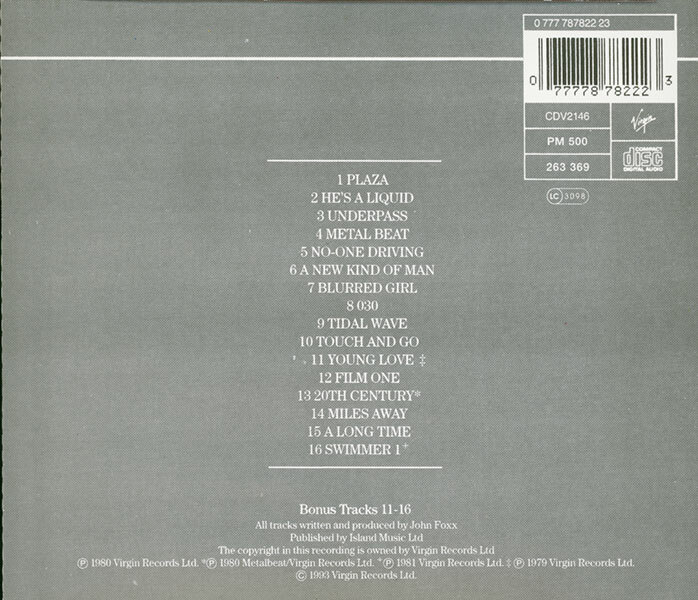 There are other tracks that have surfaced since that just might make it to the 2013 3xCD remastered version! This is a definitive compilation of his hard-edged electronic material features tracks from 1979 all the way to his very latest contemporary songs. The inclusion of a DVD makes this a no-brainer purchase in any case. Not surprisingly, the vaults have substantially been raided and the following tracks are relevant to the “Metamatic” era, a heretofore unheard extended version of “Underpass,” [my favorite song from this era] and an early version of “Burning Car.” There are some contemporary remixes [including some I’ve heard that sound really great – rare for this gambit] but we’ll not place this within the canon of the true “Metamatic ” era. Though I’m not the Post-Punk Pope, I am defining what gets consider as canon here. Phew! This was intended as a temporary stopgap measure [to appease the constabulary] until I was able to scan a record for part 3 of the series I’d begun last week, but time got away from me. I only was able to scan the record last night and in the interim, this posting has exploded into three lunch hours to write! 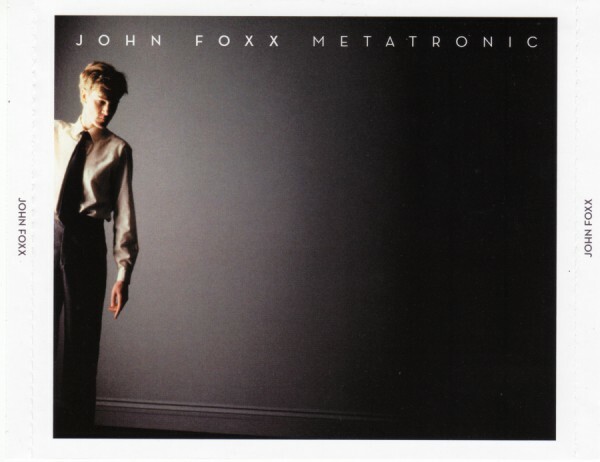 The “Metamatic” era of John Foxx, provided so crucial a template for him to explore thirty years ago and it has subsequently been the foundation of most of the large volume of material he’s recorded and released since his return to music in 1997. A fine toothed comb is what’s called for here. 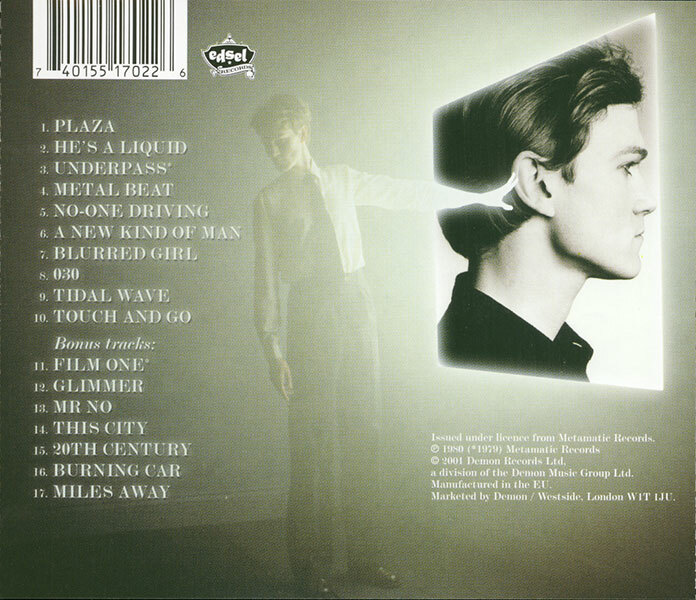 This entry was posted in Core Collection, Record Review, Remastering and tagged John Foxx, Metamatic, remastering. Bookmark the permalink. 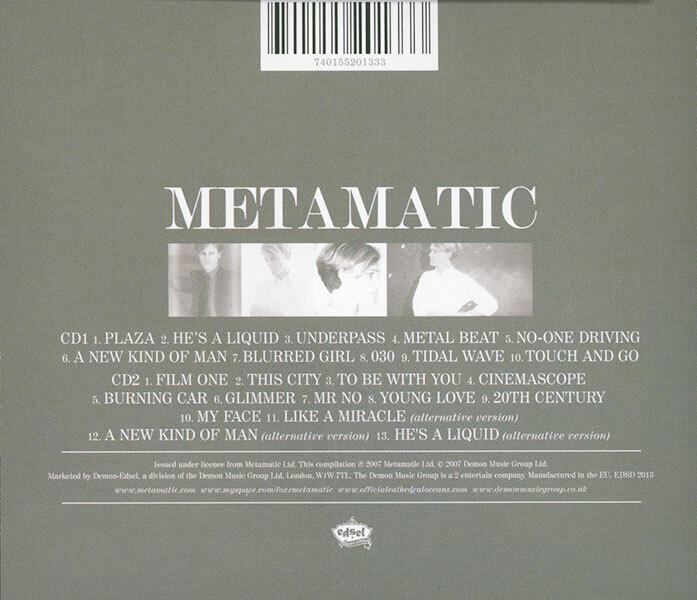 Additionally, there is a Japanese paper sleeve CD version of “Metamatic” – alas, I do not have the track listing to contribute. I suspect it is a single disc, probably with as much material as would fit. I’d love to find the CD + DVD – I trust the DVD is Region: 0? I am a huge fan of this blog and eagerly await each posting. All I can say is WOW. Now that is a definitive look at this LP. I bought it when it came out due to my undying love of those first three Ultravox LPs. 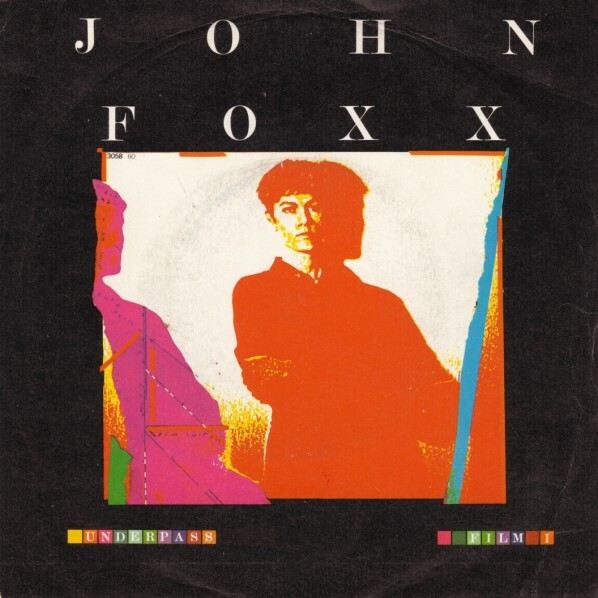 Foxx made all the difference in the quality of the Ultravox sound.